Read the statement of problem G for the definitions concerning trees. In the following we define the basic terminology of heaps. A heap is a tree whose internal nodes have each assigned a priority (a number) such that the priority of each internal node is less than the priority of its parent. As a consequence, the root has the greatest priority in the tree, which is one of the reasons why heaps can be used for the implementation of priority queues and for sorting. 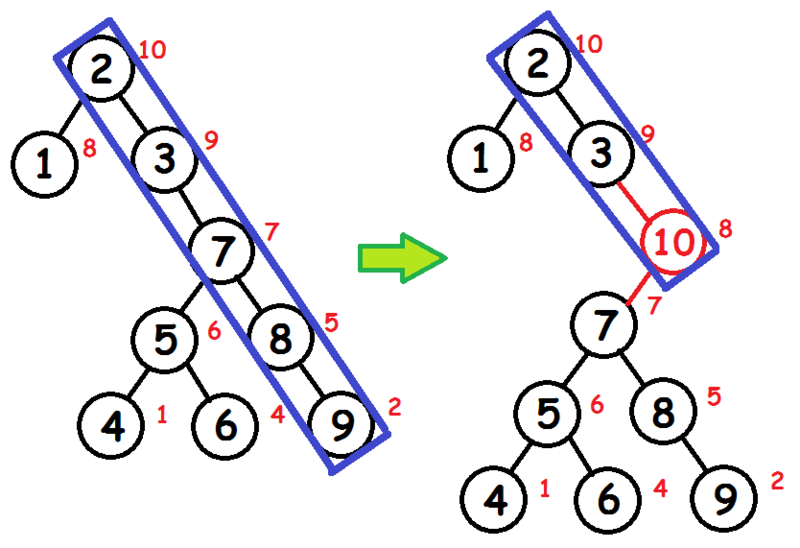 A binary tree in which each internal node has both a label and a priority, and which is both a binary search tree with respect to the labels and a heap with respect to the priorities, is called a treap. Your task is, given a set of label-priority-pairs, with unique labels and unique priorities, to construct a treap containing this data. The input contains several test cases. Every test case starts with an integer n. You may assume that 1<=n<=50000. Then follow n pairs of strings and numbers l1/p1,...,ln/pn denoting the label and priority of each node. The strings are non-empty and composed of lower-case letters, and the numbers are non-negative integers. The last test case is followed by a zero. For each test case output on a single line a treap that contains the specified nodes. A treap is printed as (< left sub-treap >< label >/< priority >< right sub-treap >). The sub-treaps are printed recursively, and omitted if leafs.